Note: We are looking at long term trends here so this isn’t a big deal, but the Federal Reserve pointed out that Hurricane Harvey is responsible for approximately three-quarters of the decline in the latest industrial production report. Expect the Harvey and Irma effects to be with us for a long time. Industrial production is the red-headed step-child of coincident economic statistics. The entire market stops, and then quickly restarts, when the BLS releases the employment report. The Census’s retail sales number receives less fanfare, but it does have a certain amount of headline grabbing power despite its unruly nature. In contrast, the Federal Reserve’s industrial production release receives no attention. This is unfortunate, because it contains a great deal of salient information. And there is no disputing its economic importance: according to BEA industry output data, manufacturing is one of the largest contributors to total industry output. The above chart shows all the primary coincident indicators shifted to base 100. All – except industrial production – have risen above their respective pre-recession highs. It peaked at the end of 2015, dipped for a few years, and only recently increased to higher levels. This statistic has hit consistently lower peaks for the last three expansions. This has two important ramifications. First, it weakens investment demand. Why add to your physical plant when you’re employing a lower percentage of it? Second, this may be a fundamental reason for weak price pressures. Why raise prices when instead all you have to do is bring more of your dormant capacity online? There are two categorization systems used by the Federal Reserve to break down industrial production: major industry groups and major market groups. We will take those in turn. We’ll break this data down into 4 sub-components, starting with durable and nondurable manufacturing. Durable manufacturing (in red) first peaked in mid-20124 and again in 2017. But it still hasn’t advanced much beyond its pre-recession level. It’s doubtful it will do so; auto sales are declining and the auto dealer sales/inventory ratio is near a multi-decade high. Non-durable goods dropped about 10% during the recession and only recently started to rise from the pre-recession lows. Utilities (top chart) have moved sideways for the duration of this expansion. We suspect increased energy efficiency is having an impact, a good thing. That leaves mining (bottom chart) to provide the sold growth engine. It declined for 30 years (1980-2010) before growing strongly because of the fracking revolution. That has proved to be an unstable thing, but if it weren’t for fracking, there would be no major move in industrial production along industry lines. Durable production (in red) has risen to slightly above pre-recession levels, but has yet to move meaningfully beyond that level. Nondurable production (in blue) remains below its prerecession level – so much so that it’s highly doubtful it will advance beyond its previous high. Business equipment (in green) is stuck near its pre-recession level. Construction production (in red) was understandably high during the housing bubble. It dropped sharply during the recession and has been rising consistently since. General business supplies (in blue) is still far below pre-recession levels. Durables production (in blue) is slightly above it pre-recession level while nondurable goods are sharply lower. There has been no meaningful growth in either measure dor at least several years. And it is the only one that has meaningfully grown during this expansion. Regardless of how you slice the data, The United States’ physical production hasn’t grown meaningfully during this expansion. The best performing sector in the consumer areas is durables, and they’re still near pre-recession levels. Overall business supplies levels are also lackluster. If it weren’t for oil, we’d be seeing no growth in industrial production. Just around the Corner? Maybe Not. A very smart analyst joked yesterday that the Consumer Price Index is the new Nonfarm Payroll. Since the FOMC has made it clear that they are waiting for 2% inflation—or perhaps Godot—all eyes are searching for signs we might be getting there, so all price indexes are good fodder, especially the PCE, the Fed’s favored index. 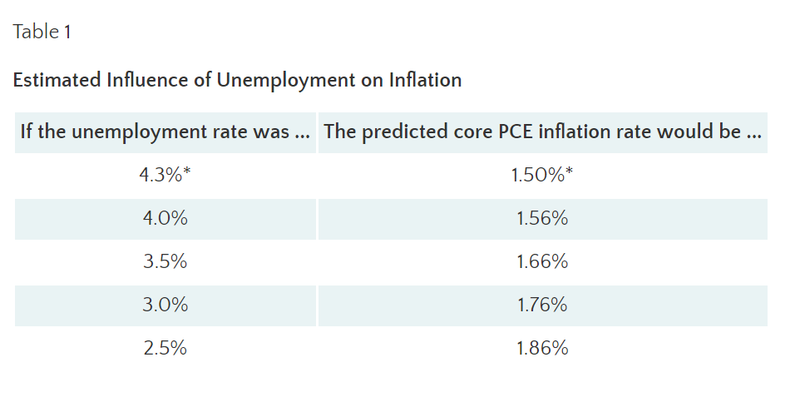 The FOMC’s models have continually demonstrated a “just around the corner,” feature where, despite currently weak PCE measures, the expectation is that higher inflation would occur in the near future. Above is a logarithmic graph of the three components of the PCE price index: durable goods prices (in blue), non-durable goods prices (in red) and service prices (in green). Two key visual elements are apparent: durable goods prices have been consistently declining since the mid-1990s. Non-durable goods prices have been stagnant to slightly lower for the last 5 years. That leaves services as the only PCE price index component that can exert upward pressure. Durable goods prices (in blue) have been subtracting from price growth for the last 20 years. Non-durable goods prices (in read) have been declining since 2011-2012; they subtracted from PCE price growth for most of 2015 and only recently turned positive. Only service prices (in green) have increased PCE price pressures on a consistent basis. There are several important lessons to draw from this data. First, the PCE price index looks at prices from a business perspective. According to the Cleveland Fed, “the PCE is based on surveys of what businesses are selling.” The above charts indicate that neither durable goods nor non-durable goods companies have any pricing power. Second, the Y/Y percentage change in service prices has been declining. Third, price growth for 31% of PCEs are either negative or very weak. That means the remaining 70% of prices would have to increase at a faster Y/Y rate to hit the Fed’s 2% PCE Y/Y inflation target. This runs counter to the second conclusion regarding service prices, that the y/y rate of change is narrowing. Those trends mean the Fed cannot hit its 2% y/y target under the current circumstances. During first quarter of 2017, economic growth declined in five of the seven Plains states. Within this region, only Missouri and North Dakota saw their economies grow during the quarter. North Dakota’s growth came from a reviving energy sector that contributed 1.7pp and offset almost the entire 1.9pp drop in its agriculture sector. Missouri’s agriculture sector declined by 0.8pp, but this was offset by relatively strong growth in durable goods manufacturing and wholesale trade. The states that experienced the greatest declines in output were Nebraska (-4.0%), South Dakota (-3.8%), and Iowa (-3.2%). Lower prices for row crops likely explain the decline. During the first quarter of 2017 corn prices averaged 4.4% below the prior year and wheat prices were down 11.7%. Soybean prices were up somewhat compared to 2016 but were trending lower. Nationwide the agriculture, forestry, fishing and hunting sector subtracted 0.41pp from the overall annualized growth, which totaled 1.1%. 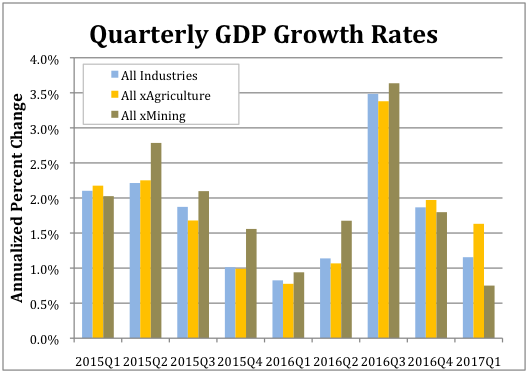 As the accompanying chart shows, absent the agriculture sector national GDP grew by 1.6% during the first quarter. The fasted growing sector in Q1 was mining, which includes oil extraction. It was up 0.3%. As shown in the accompanying chart, excluding the mining sector national GDP would have only increased by 0.8%. Finally, a couple of standout states for the quarter were Washington and Wisconsin. Washington continued a pattern of strong performance from 2016 when it took the blue ribbon. Its economy grew at an annualized rate of 2.7% during the first quarter and by 3.8% for all of 2016. This growth was driven by its information sector, which accounted for 1.7pp, and durable goods manufacturing, which accounted for 0.7pp, of the overall growth. Wisconsin’s 2.1% annualized growth for the first quarter represents a reversal of fortune from 2016 during, when its economy grew by only 0.9%. The sectors that contributed the most to its first quarter 2017 growth were real estate (0.6pp), durable goods manufacturing (0.4pp) and nondurable goods manufacturing (0.4pp).